This weekend sees the release of Now You See Me 2, the sequel to the 2013 hit about a team of crime-fighting magicians. As part of the promotion, Lionsgate has created a set of vintage poster mock-ups showing "The Four Horseman" as classic magicians of the Golden Age. As you can see, star Jesse Eisenberg is given the Houdini treatment. 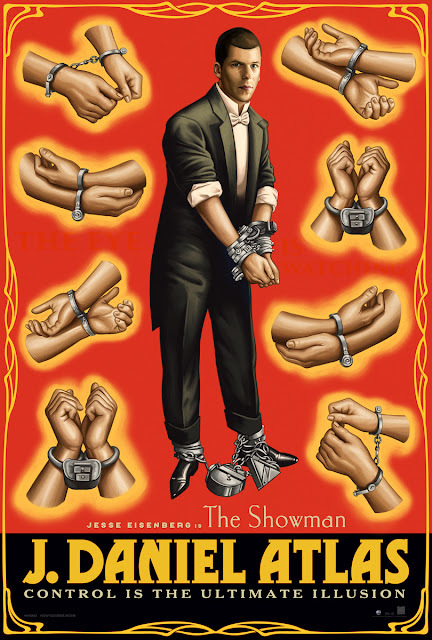 While Houdini doesn't get a name-check in the sequel, you can spot several Houdini posters and photographs in the backgrounds of Daniel's apartment, the Macau magic shop, and the headquarters of The Eye. The movie also opens with a overboard safe escape gone wrong. You can read a review at Deadline Hollywood.